Neutering a cat, in a male (tom cat) this is known as castration – where the testes are removed, and in a female (called a queen) this is known as spaying –where the ovaries and uterus are removed. 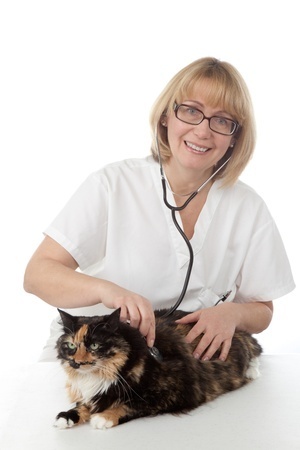 What are the potential health problems in unneutered female cats? Unneutered queens are more likely to suffer from a condition known as pyometra (where the womb fills with pus) this is a potentially life threatening condition. They are also at a risk of developing mammary tumours, mastitis, as well as FeLV and FIV, which are passed on by males when mating. It is important to neuter a kitten before it can reproduce at what we think is a very young age. Depending on the breed and the time of the year, your kitten could come into season as early as 4 months old, but usually it is around 6 months old. From then on she could potentially have up to three litters a year with an average litter size of four kittens each time. Large numbers of unwanted kittens are born each year and result in a large expense for rescue organisations. There’s also the horrid euthenasing of unwanted animals. What’s involved in a cat being spayed? The operation involves the cat having a general anaesthetic and surgical removal of the ovaries and uterus, through a small cut in the cat’s abdomen. The wound will be stitched and the cat will have to be kept in at home for a period of time after the operation. What are the characteristics of unneutered male cats? A tom cat will wander over a larger area while looking for females to mate with. They are more likely to fight with other cats and are at a higher risk of infections, which are expensive to treat. They are also prone to spraying around their environment and even inside the house. The smell is awful! What are the potential health problems in unneutered male cats? Fighting male cats are more likely to spread viruses such as FeLV and FIV and other diseases. A Tom cat can mate with many females in just one period of sexual activity, thus creating many kittens, many of which are abandoned by their owners. An uncastrated Tom can reproduce at least once a day if he finds females in heat. A female cat can birth up to 15 kittens per litter. So basically they can sire thousands & thousands of kittens per year. Castrating male cats- what’s involved? The operation involves the cat having a short general anaesthetic. Small cuts are made in the scrotum through which the testes are removed. The cuts are so small they rarely require stitches.